Earlier today, the executive director of the San Diego Republican Party tweeted this image from in front of the Hooters in Rancho Bernardo. 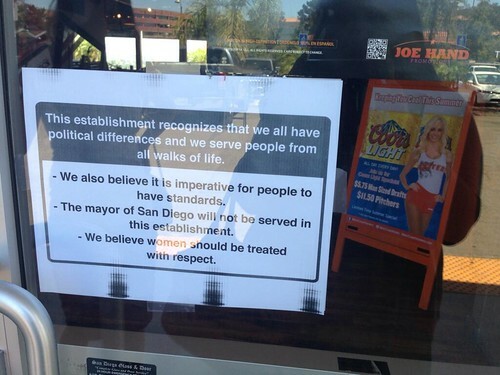 According to the manager of that restaurant, all of the Hooters locations in the city (Rancho Bernardo is in the zone) have taken up this policy. “The signs went up at our four locations in San Diego this morning,” said Melissa Fry, director of marketing for HootWinc, the west coast Hooters franchise. “It’s not a political move for us in any way, shape, or form. We’re strictly taking a stand for the fair treatment of women. At our franchise alone, we employ 1100 beautiful, talented women.” And so Mayor Bob Filner, who has been locked out of city hall, has just been locked out of this fine family restaurant. UPDATE: San Diego-based reporter Randy Dotinga informs me that this poster uses a text and design suggested by Glenn Beck. Who says he’s lost his cultural cachet?